The exhibition celebrating 20 years of design history for the Swiss eyewear brand, götti SWITZERLAND, was launched with a major opening on Sunday, March 24th in Lucerne. The latest spring collection was also introduced at the opening, exhibited in its own showroom. 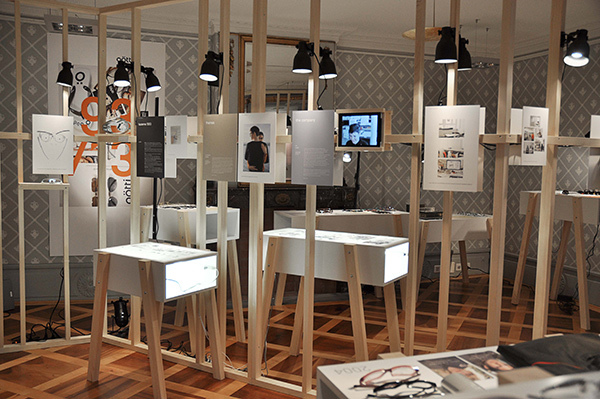 In the premises where designer Sven Götti sketched the designs for his first eyeglasses, the exhibit shows a cross section of the last 20 years and sheds light on the manufacturing of eyeglass frames, the design process and marketing behind the product. The brand looks back on two decades in which it has become Switzerland’s most successful eyewear brand, one that is now popular around the world. Upon entering the historic Rüttimann House, visitors are greeted by a 3.5 meter long chandelier. This showpiece is fitted with 541 pairs of sunglasses from past years and was specially created for this exhibition by the Zurich design studio, Bureau Purée. It leads up the staircase directly to the upper floor of the Götti+Niederer optics shop, where both the exhibition and the showroom are located. The old Rüttiman parlor is ringed with a large wooden frame containing picture plates dividing the exhibit into different subject areas. Highlights and milestones from past collections are displayed on tables lit with small reading lamps. The first collection from 1996 sets visitors stylistically back into another era, in which the signature and design philosophy of Sven Götti is already recognizable. Another table from the year 2003 contains unique creations from the Swiss fashion designer, Daniel Herman, made for a fashion show in London. Many prototypes, unrealized shape experiments, blanks and stamping tools from the producer in Japan are also on display. Visitors are encouraged to rotate the temples of a pair of sunglasses on one table. This is to demonstrate the innovative eyeglass hinge patented several years ago by götti. The Swiss company received numerous design prizes throughout the world after making waves throughout the sunglass market with this technical innovation. The history of the eyewear brand goes back to 1993 when Sven Götti and Urs Niederer opened the optics shop, Götti+Niederer, in a centuries old patrician house in Lucerne’s old city. The contemporarily furnished premises and a select product range quickly led to the shop’s success. Sven Götti established his own eyewear collection on this basis by launching a small collection made from natural horn in 1994. The eyeglasses proved to be very popular and so Götti steadily developed the eyewear collection with success. Now, 20 years after those first glasses were launched, a company has arisen that offers its glasses and sunglasses at more than 1,200 specialty shops around the world. Through its presence in over 30 countries, Götti Switzerland is one of the only Swiss eyewear brands to achieve renown throughout the international optics industry. It has since become one of the leading labels in the eyewear industry in terms of design and quality and counts major optics specialty shops around the globe among its customers. Götti SWITZERLAND was awarded the Swiss Economic Award in acknowledgement of this success story in 2008. In addition to the eyewear brand’s history, the exhibition also offers a glimpse behind the scenes. What does it take to sell eyeglasses around the world? How does a Swiss company manage to find fans for its products in Paris, Seoul and New York? And how are the marketing and sales of the brand organized today? The exhibition concept created especially for these premises mirrors the brand’s philosophy as well as the products exhibited and enables visitors to immerse themselves in the götti SWITZERLAND design world. The exhibition can still be visited until April 20th at Götti+Niederer at Mühlenplatz 1 in Lucerne.